Penrose has made contributions to the mathematical physics of general relativity and cosmology. He has received several prizes and awards, including the 1988 Wolf Prize for physics, which he shared with Stephen Hawking for the Penrose–Hawking singularity theorems. 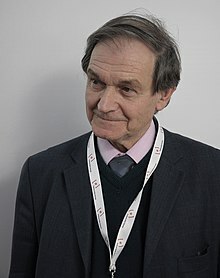 Born in Colchester, Essex, Roger Penrose is a son of psychiatrist and geneticist Lionel Penrose and Margaret Leathes,[a] and the grandson of the physiologist John Beresford Leathes and his Russian wife, Sonia Marie Natanson, who had left St. Petersburg in the late 1880s. His uncle was artist Roland Penrose, whose son with photographer Lee Miller is Antony Penrose. Penrose is the brother of physicist Oliver Penrose and of chess Grandmaster Jonathan Penrose. Penrose attended University College School and University College, London, where he graduated with a first class degree in mathematics. In 1955, while still a student, Penrose reintroduced the E. H. Moore generalised matrix inverse, also known as the Moore–Penrose inverse, after it had been reinvented by Arne Bjerhammar in 1951. Having started research under the professor of geometry and astronomy, Sir W. V. D. Hodge, Penrose finished his PhD at Cambridge in 1958, with a thesis on "tensor methods in algebraic geometry" under algebraist and geometer John A. Todd. He devised and popularised the Penrose triangle in the 1950s, describing it as "impossibility in its purest form", and exchanged material with the artist M. C. Escher, whose earlier depictions of impossible objects partly inspired it. Escher's Waterfall, and Ascending and Descending were in turn inspired by Penrose. On 18 December 2018, Penrose appeared on the Joe Rogan Experience podcast. In 2010, Penrose reported possible evidence, based on concentric circles found in WMAP data of the CMB sky, of an earlier universe existing before the Big Bang of our own present universe. He mentions this evidence in the epilogue of his 2010 book Cycles of Time, a book in which he presents his reasons, to do with Einstein's field equations, the Weyl curvature C, and the Weyl curvature hypothesis (WCH), that the transition at the Big Bang could have been smooth enough for a previous universe to survive it. He made several conjectures about C and the WCH, some of which were subsequently proved by others, and he also popularized his conformal cyclic cosmology (CCC) theory. ^ Penrose and his father shared mathematical concepts with Dutch graphic artist M. C. Escher which were incorporated into a lot of pieces, including Waterfall, which is based on the 'Penrose triangle', and Up and Down. ^ Penrose, R (2005). The Road to Reality: A Complete guide to the Laws of the Universe. Vintage Books. ISBN 978-0-09-944068-0. ^ Rudolph Peters. "John Beresford Leathes. 1864-1956". Royal Society Publishing. ^ Elementy.ru (May 2016). "Roger Penrose. Cycles of Time: Is It Possible to Discern the Previous Universe Through the Big Bang?". YouTube. ^ Penrose, R. (1955). "A generalized inverse for matrices". Mathematical Proceedings of the Cambridge Philosophical Society. 51 (3): 406. Bibcode:1955PCPS...51..406P. doi:10.1017/S0305004100030401. ^ "Cycles of Time: An Extraordinary New View of the Universe by Roger Penrose – review". The Guardian. ^ Penrose, Roger (January 1965). "Gravitational Collapse and Space-Time Singularities". Physical Review Letters. 14 (3): 57–59. Bibcode:1965PhRvL..14...57P. doi:10.1103/PhysRevLett.14.57. ^ R. Penrose (1979). "Singularities and Time-Asymmetry". In S. W. Hawking; W. Israel (eds.). General Relativity: An Einstein Centenary Survey. Cambridge University Press. pp. 581–638. ^ Terrell, James (1959). "Invisibility of the Lorentz Contraction". Physical Review. 116 (4): 1041–1045. Bibcode:1959PhRv..116.1041T. doi:10.1103/PhysRev.116.1041. ^ Penrose, Roger (1959). "The Apparent Shape of a Relativistically Moving Sphere". Proceedings of the Cambridge Philosophical Society. 55 (1): 137–139. Bibcode:1959PCPS...55..137P. doi:10.1017/S0305004100033776. ^ Jaromír Korčák (1938): Deux types fondamentaux de distribution statistique. Prague, Comité d'organisation, Bull. de l'Institute Int'l de Statistique, vol. 3, pp. 295–299. ^ Steinhardt, Paul (1996). "New perspectives on forbidden symmetries, quasicrystals, and Penrose tilings". PNAS. 93 (25): 14267–14270. Bibcode:1996PNAS...9314267S. doi:10.1073/pnas.93.25.14267. PMC 34472. PMID 8962037. ^ "Roger Penrose at Rice, 1983-87". Rice History Corner. 22 May 2013. ^ Johnson, George (27 February 2005). "'The Road to Reality': A Really Long History of Time". The New York Times, USA. Retrieved 3 April 2017. ^ "If an Electron Can Be in Two Places at Once, Why Can't You?". Archived from the original on 1 November 2012. Retrieved 27 October 2008. ^ "Dr. Roger Penrose at Penn State University". Archived from the original on 16 April 2008. Retrieved 9 July 2007. ^ Gurzadyan, V.G. ; Penrose, R. (2010). "Concentric circles in WMAP data may provide evidence of violent pre-Big-Bang activity". volume "v1". arXiv:1011.3706 [astro-ph.CO]. In an article at "King's College London - Department of Mathematics". Archived from the original on 25 January 2001. Retrieved 22 October 2010. L.J. Landau at the Mathematics Department of King's College London writes that "Penrose's argument, its basis and implications, is rejected by experts in the fields which it touches." ^ Marvin Minsky. "Conscious Machines." Machinery of Consciousness, Proceedings, National Research Council of Canada, 75th Anniversary Symposium on Science in Society, June 1991. ^ Tegmark, Max (2000). "The importance of quantum decoherence in brain processes". Physical Review E. 61 (4): 4194–4206. arXiv:quant-ph/9907009. Bibcode:2000PhRvE..61.4194T. doi:10.1103/physreve.61.4194. ^ a b Tetlow, Philip (2007). The Web's Awake: An Introduction to the Field of Web Science and the Concept of Web Life. Hoboken, New Jersey: John Wiley & Sons. p. 166. ISBN 978-0-470-13794-9. ^ Hagan, S.; Hameroff, S. & Tuszyński, J. (2002). "Quantum Computation in Brain Microtubules? Decoherence and Biological Feasibility". Physical Review E. 65 (6): 061901. arXiv:quant-ph/0005025. Bibcode:2002PhRvE..65f1901H. doi:10.1103/PhysRevE.65.061901. PMID 12188753. ^ "Clarifying the Tubulin bit/qubit – Defending the Penrose-Hameroff Orch OR Model (Quantum Biology)". YouTube. 22 October 2010. Retrieved 13 August 2012. ^ Roger Penrose & Stuart Hameroff (4 July 1992). "Consciousness in the Universe: Neuroscience, Quantum Space-Time Geometry and Orch OR Theory". Journal of Cosmology. Quantumconsciousness.org. Archived from the original on 16 June 2012. Retrieved 13 August 2012. ^ "Anirban Bandyopadhyay". ResearchGate. Retrieved 22 February 2014. ^ "Discovery of quantum vibrations in 'microtubules' inside brain neurons supports controversial theory of consciousness". ScienceDaily. Retrieved 22 February 2014. ^ S. Hameroff; R. Penrose (2014). "Consciousness in the universe: A review of the 'Orch OR' theory". Physics of Life Reviews. 11 (1): 39–78. Bibcode:2014PhLRv..11...39H. doi:10.1016/j.plrev.2013.08.002. PMID 24070914. ^ a b "The Peter & Patricia Gruber Foundation, St. Thomas US Virgin Islands – Grants and International Awards". Gruberprizes.org. 8 August 1931. Retrieved 13 August 2012. ^ "Vanessa Penrose". Abingdon School. 6 July 2012. Retrieved 13 August 2012. ^ "Big Bang follows Big Bang follows Big Bang". BBC News. 25 September 2010. Retrieved 1 December 2010. ^ "Supplement 53696,10 June 1994, London Gazette". The Gazette. Retrieved 16 August 2015. ^ "Honorary Graduates 1989 to present". University of Bath. Retrieved 18 February 2012. Tegmark, Max (2000). "The importance of quantum decoherence in brain processes". Physical Review E. 61 (4): 4194–4206. arXiv:quant-ph/9907009. Bibcode:2000PhRvE..61.4194T. doi:10.1103/physreve.61.4194.